Rebel Inc. launches on Android: get it now on the Google Play Store! Since our brand new game Rebel Inc. initially launched in December an Android version has been by far the most discussed request on our Facebook and Twitter feeds. 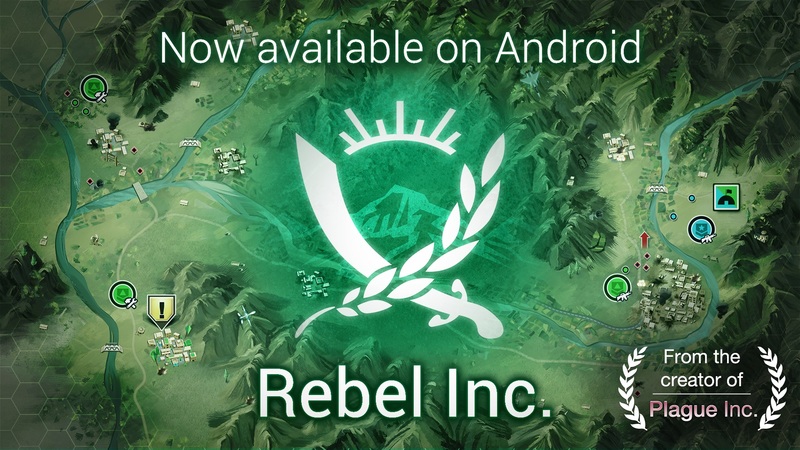 Now we’re very excited to announce that Rebel Inc., is available on Android via the Google Play Store! ‘Droid owners: can you stop the insurgency? The war is over, but we all know that doesn’t mean anything. To stabilise the country, you’ll have to balance military and civilian priorities to win the hearts and minds of the people, whilst also stopping insurgents from seizing power. Intricately executed with beautiful graphics and critically acclaimed gameplay - Rebel Inc.. offers a deeply engaging, strategic challenge inspired by the complexities and consequences of modern counter insurgency. For those wondering about the future of Rebel Inc. (specifically about a PC/console version), you can find out more info in our Rebel Inc. FAQ here. Although a fictional game,Rebel Inc. looks at important real world issues and we’ve made every effort to deal with them sensitively. The game has been extensively researched and developed in cooperation with leading regional politicians, business people, and journalists, as well as international charities, experts and governments. And you can follow James, the designer of Rebel Inc. and Plague Inc. here. Rebel Inc. Update 3 - The Tanks and Caves expansion is live now on iOS and Android! Rebel Inc. Update 3 is coming! Apply to be a beta tester! New game announced: Rebel Inc.